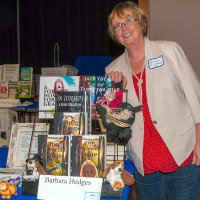 Barbara M Hodges is the author or co-author of 12 books of fiction. She lives on the central coast of California with her husband Jeff and two rescued basset hounds, Heidi and Monty. Barbara loves basset hounds and is very involved with basset hound rescue. You will find a basset hound in all of her books.